Heat oven to 375°F. Spray 13x9-inch (3-quart) glass baking dish with nonstick cooking spray. In sprayed baking dish, combine carrots, rice, corn nuggets, broth and 2 tablespoons of the teriyaki sauce; mix well. 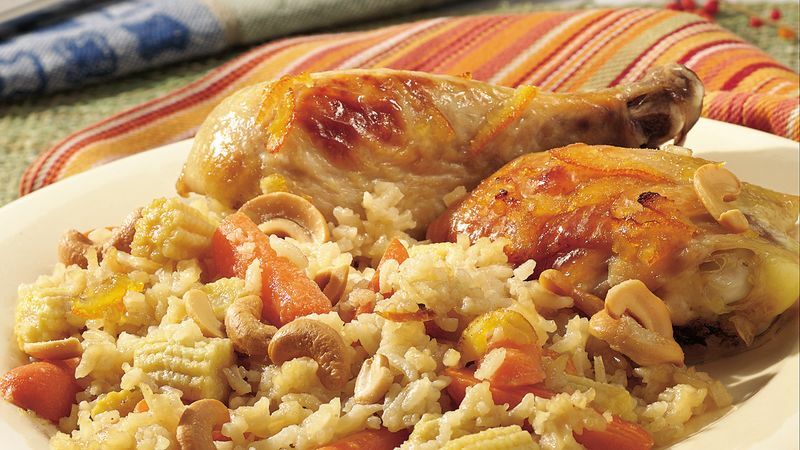 Arrange chicken pieces over rice mixture. In small bowl, combine remaining 3 tablespoons teriyaki sauce, orange marmalade and ginger; blend well. Spoon mixture over chicken and rice mixture. Cover with foil. Bake covered at 375°F. for 45 minutes. Uncover baking dish; bake an additional 15 to 30 minutes or until chicken is fork-tender and juices run clear. Sprinkle with cashews. Use one 14-ounce can whole kernel corn in place of the baby corn nuggets; drain the corn before you use it. For added flavor and texture, toast the cashews. Spread them on a cookie sheet; bake at 350°F. for 8 to 10 minutes, or until golden brown, stirring occasionally. To reduce the fat in each serving of this recipe by about 10 grams, remove the skin from the chicken. Each serving of the lower-fat version has about 90 fewer calories than each serving of the original recipe.